Roj Rashne Mah Avan, 1380 Yz. Last Sunday was a day of hectic events. Roj Khorshed Mah Avan marked the 10th anniversary of the establishment of the Ustad Saheb Behramshah Nowroji Shroff Daremeher. From the previous day and early morning, volunteers were seen making last minute cleaning and festooning each door of the Daremeher with garlands. At 6:30 am the Havan Gah Machi weighing 5kgs was offered by the Trustees of the Zoroastrian Radih Society to the Padshah Saheb. The Salgreh Jashan was held at 10:00 am and saw a very large turnout of colony members. Here is a photograph of the freshly painted and renovated Daremeher in the morning. The evening function started at 6:30 pm with a Humbandagi. Thereafter the Panthaky, Ervad Marzban J. Hathiram gave a short introduction and welcome to the invitees. Seen in the photograph below are (left to right) Mr. Nariman Mody, Mr. Roossi Talati, Ms. Pilamai Lalkaka – all Trustees of the ZRS, Ervad Marzban J. Hathiram and Boywalla Ervad Percy K. Bhadha. Thereafter, the main speech of the evening on the Advent of Shah Behram Varzavand was delivered by Ervad Marzban J. Hathiram. A detailed report on the speech will be posted later on. A record crowd of over 300 guests both from within the colony and outside listened in rapt attention to the over 90 minute speech. Here are photographs showing the crowd. Prominently seen in the front row (third from left) is the grandson of Ustad Saheb Behramshah N. Shroff, Mr. Nariman Kotwal, who resides in the colony. After the main speech the volunteers who toiled for nearly 6 months to clean, renovate and repaint the Daremeher were felicitated. The photo below shows Mr. Soli Kodia being thanked by the Trustees of the ZRS. After closing remarks and Humbandagi, the guests heartily partook of a lavish dinner catered by Mr. Kurush Dalal, son of late Katy Dalal. Tuesday, 29th March marked the Fasli Salgreh of the Daremeher. On this day, after the Havan Gah Machi in the morning, the Salgreh Jashan was held at 10:30 am. 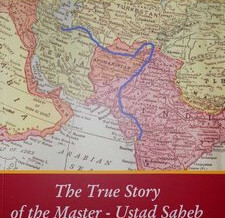 After the Jashan, a function was held to release the book on the life of the Master. Speaking on the occassion, Mr. Hormuzdiar H. Suntoke, Trustee of the ZRS explained the difficulties faced by the Trust in reclaiming the land which was illegally acquired by the government many years ago and the sterling services provided by senior solicitor Mr. Sorabji Morris of Little & Co. who was also present for the function despite his very advanced age. Thereafter, I spoke a few words describing how the book on the life of the Master took shape and the various difficulties faced in printing the book. After these remarks the book was officially released at the hands of Mr. Sorabji Morris. Here is a photo of the book cover. 1. The Zoroastrian Radih Society, Vatsa House, Janmabhoomi Marg, Fort Mumbai. Contact Mr. Gustad Irani. 2. N. D. Moolla & Sons, the sandalwood and religious items shop next to Wadiaji Atash Behram. Contact Mr. Noshir Moolla. 3. Boyce Agiary, Tardeo. Contact Mr. Marzban Palsetia. 4. Ustad Saheb Behramshah N. Shroff Daremeher, Behram Baug. Contact Ervad Marzban J. Hathiram. Overseas Parsis interested in buying the book may send an email to me: [email protected] with their address and I will mail them the expected courier costs.